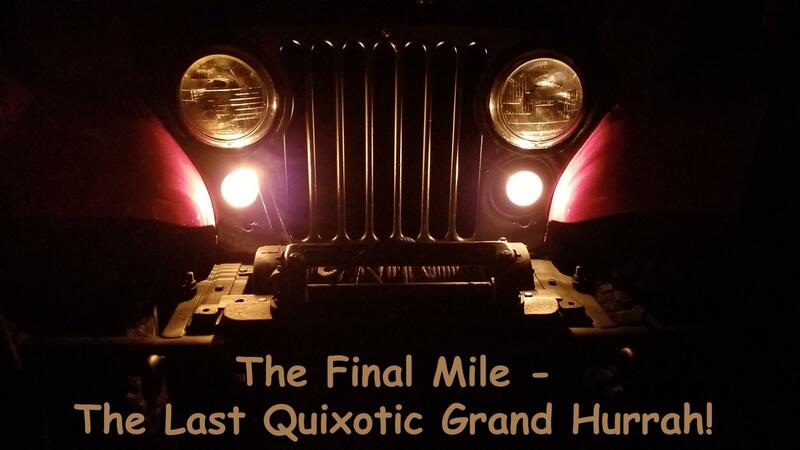 This page, The Final Mile, is about our supporters, friends, family, and sponsors who have come together to make The Final Mile, Loren’s Last Quixotic Grand Hurrah, a reality. Back in the summer of 2016 Laurence, Loren's nephew visited Loren and me here in Salmon, Idaho and saw the condition of our well-traveled 1966 CJ-5 Jeep, the Sand Ship Discovery. Then and there Laurence decided to start a project to refurbish the Discovery. Little did he know, Pandora’s Box was opened! Human Nature was the adversary in the Middle East. Thirty years ago when we were in Israel and trying to drive the Sand Ship Discovery to Jordan we came upon our first insurmountable roadblock, both literally and figuratively. 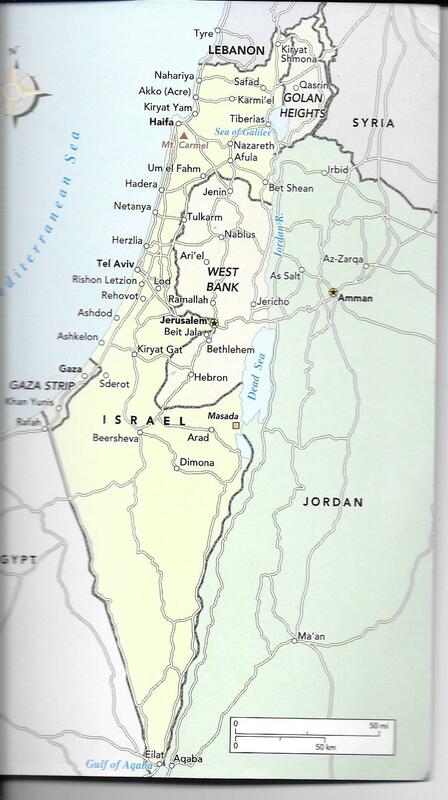 Israel and Jordan did not have diplomatic relations with each other and the border was closed. We tried talking to government officials, United Nations officials and even tourist agencies to try and get permission to get across the border, all to no avail. At one point we were even politely escorted away from the border fence by the armed Israeli military. Human Nature won. We had to return to Egypt and take a ferry boat up the Gulf of Aqaba to Jordan, thus a break in the all land route. 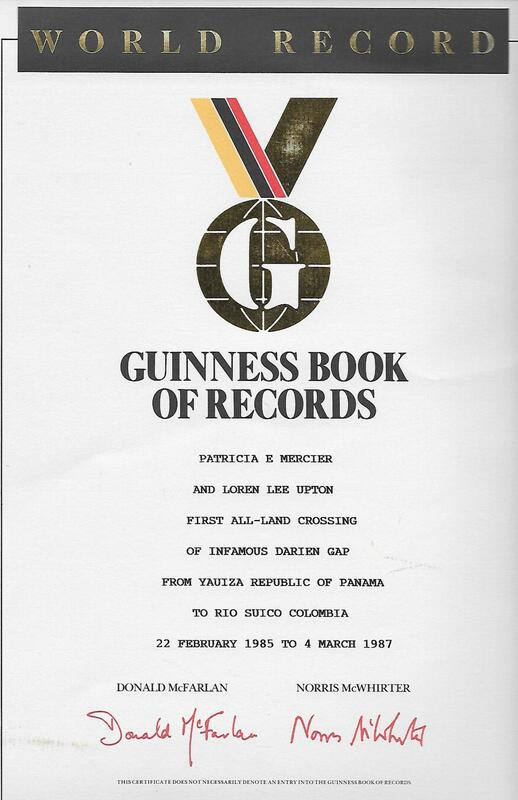 Mother Nature was the main adversary in the Darien Gap. After reaching the end of the Pan-American Highway in Panama two rainy seasons caused delays in reaching the goal, an established road in Colombia. 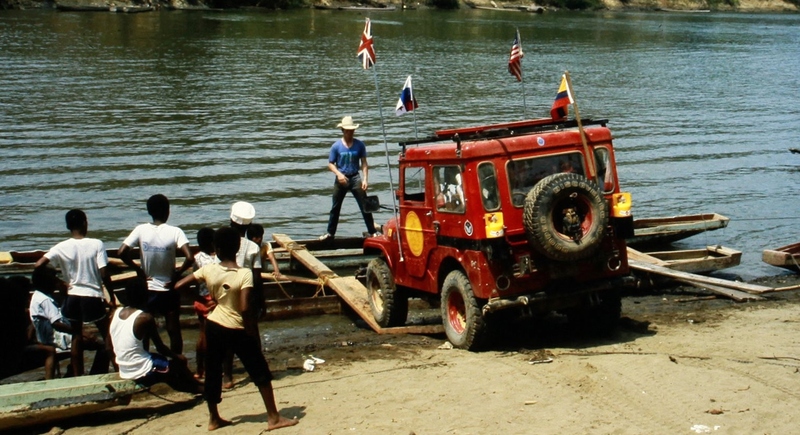 A total of 741 days were spent in the Gap to driving and winching the Sand Ship Discovery the 125 miles to that established road in Colombia. The Discovery crossed rivers, but never resorted to traveling up or down them in order to avoid difficult areas. In addition, we did something no other vehicle expeditions through the Darien Gap has done, found a dry land route through the vast Atrato Swamp in Colombia. Disappointed but determined to push on, we ended the trip at the Sletness Lighthouse, just outside the small fishing village of Gamvik, Norway, on the 4th of July, 1989. After taking one American-made vehicle around the world, we felt it very fitting to end on the most American of American holidays! 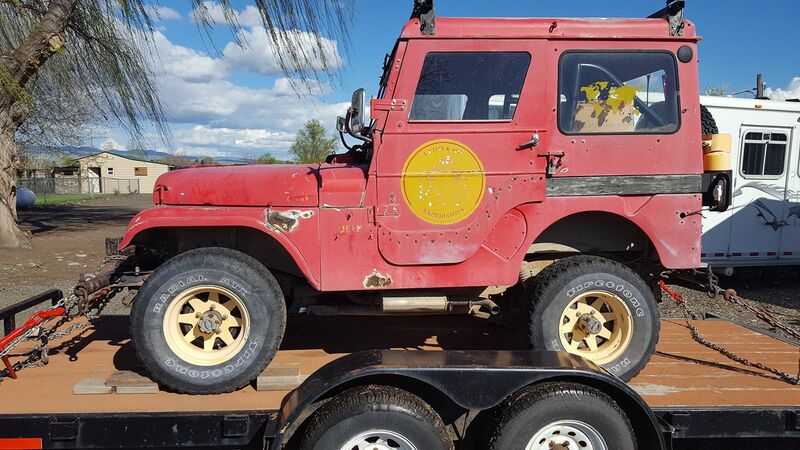 Laurence, with the dedicated help of good friend, Mike Merk and his dad, Larry Merk tore into the Sand Ship Discovery with one goal in mind, GET HER ROAD WORTHY! Along with all their spouses, they and many other volunteers devoted countless hours of work to bring the Discovery back from her twenty-five years in dry dock. The following is an account of work performed on the Sand Ship Discovery from about the beginning of November 2017 to the last weekend of January 2018. Larry Merk did the note-taking and was the “gofer” for parts. Work was done on weekends and what little spare time Laurence and Mike, and Larry had. All three men have full-time jobs, wives, and lives. Laurence is in process of building a new home. All the photos were taken of the work done on the Discovery, including the one of the Discovery’s front grill at the top of this page w by Mike Merk or his wife, Jill or Laurence Upton. 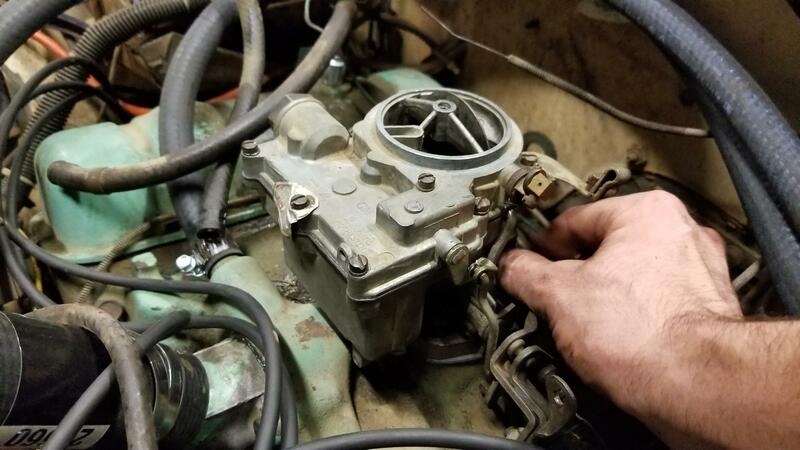 Thank you, Dave Baie for overhauling the carb! 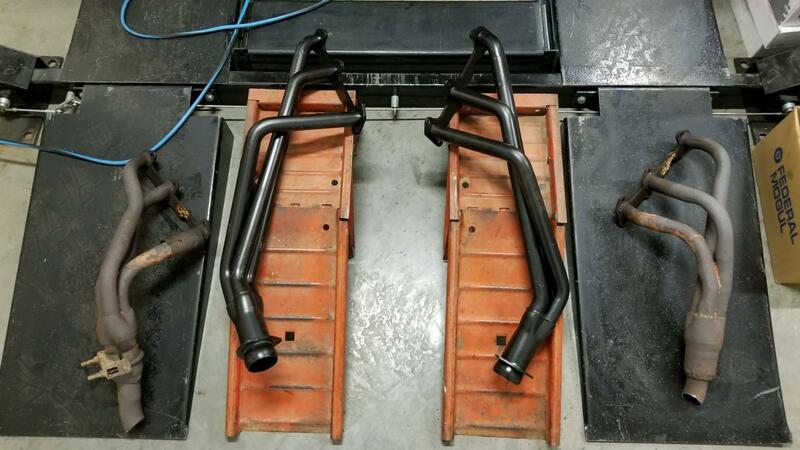 “Today I crimped all of the plug wires and finished installing all of the tune-up parts. - Pulled gas tank and inspected interior. Removed broken fuel float from the tank. - Pulled old rubber gas line and installed a new hard line from rear tank to fuel pump. 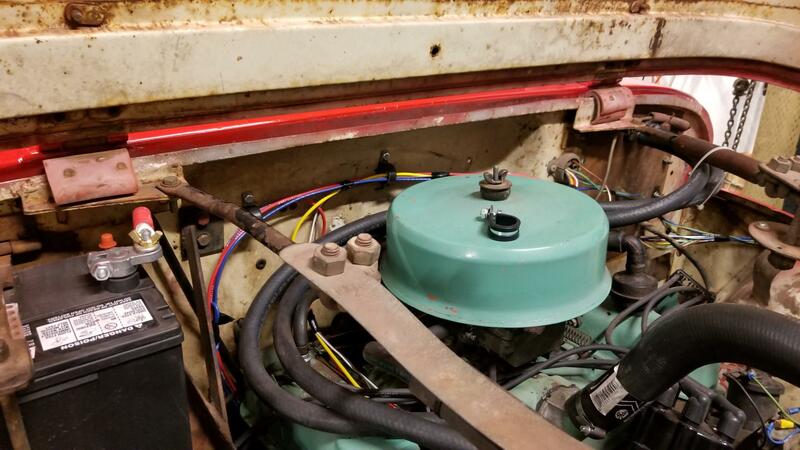 - Reinstalled gas tank with new filler hose and new connector hose to the hard line. 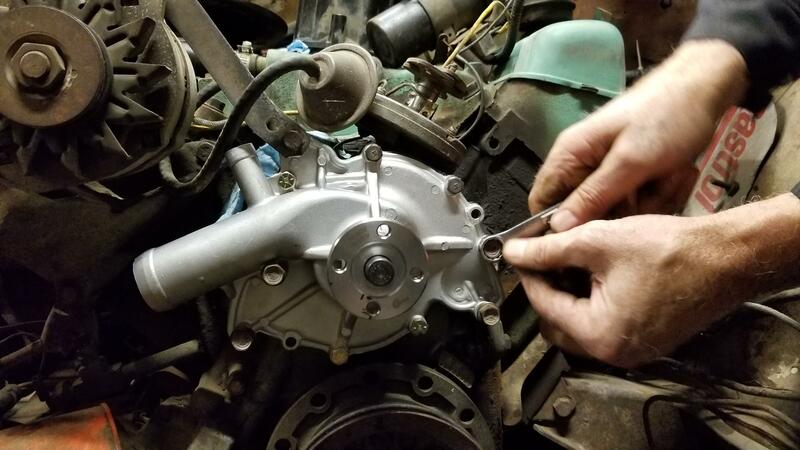 - Installed new rubber hose from the fuel pump to Racor water separator and carburetor. - Installed new gas filters. - Install new filter in the Racor fuel water separator. - Removed drain valve from water separator since it was leaking. Installed a plug. - Filled trans with gear oil. It was over 1.5 quarts low. And it is leaking. - Repaired throttle linkage for more travel. - Reinstalled radiator, even though it leaks, so we could start the engine. Added new antifreeze. - Started engine and adjusted points, timing, and idle speed. - It runs pretty well, especially after it is warmed up. - Changed engine oil and filter. - Drove it to the car wash and washed the engine, drive train, and body. Thank you, Cal Method for the use of the tire mounting machine! - Cleaned the area where front gas tanks sit and painted the floor. - Cleaned front gas tanks and painted them. 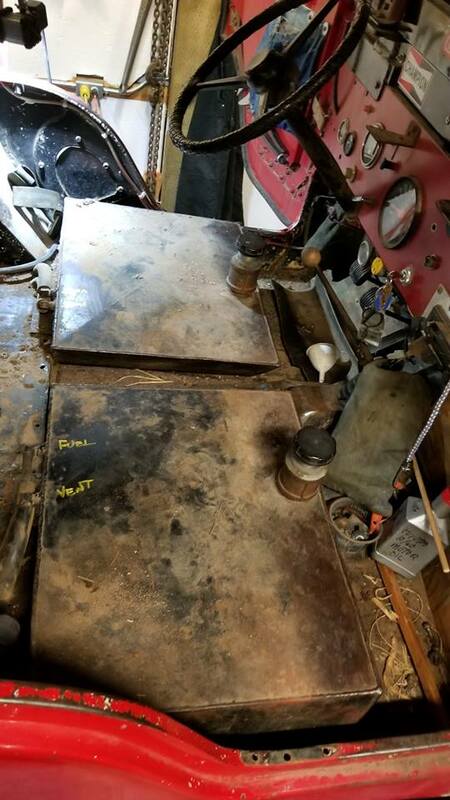 - Reinstalled gas tanks; connected fuel and vent lines. - Reinstalled front seat mount and seats. - Reinstalled battery tray and battery. - Fabricated and installed battery cables. Thank you, Ricardo Garcia, for the bodywork and paint job. Personally, I love the paint job, she looks good, but her battle scars that she received during the long and arduous crossing of the Darien Gap are still proudly displayed! - Leaking between transmission and transfer case. 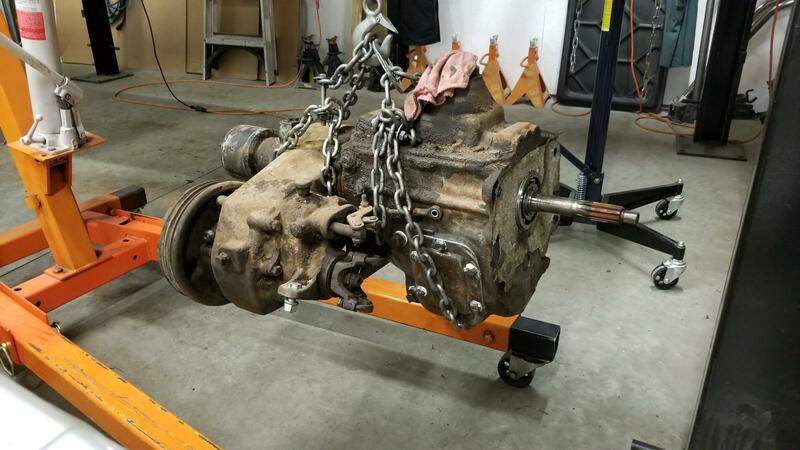 - Pulled transfer case. Found 2 bolts that were too LONG, and not obvious to the naked eye. - Installed new gaskets and seal. 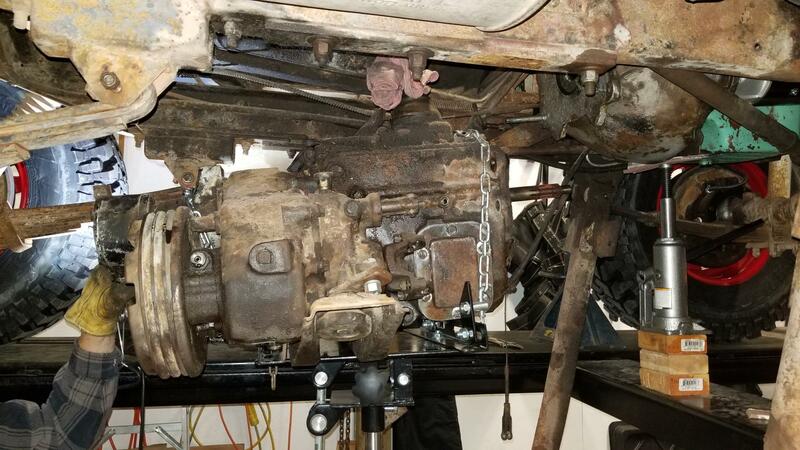 Re-installed transfer case. 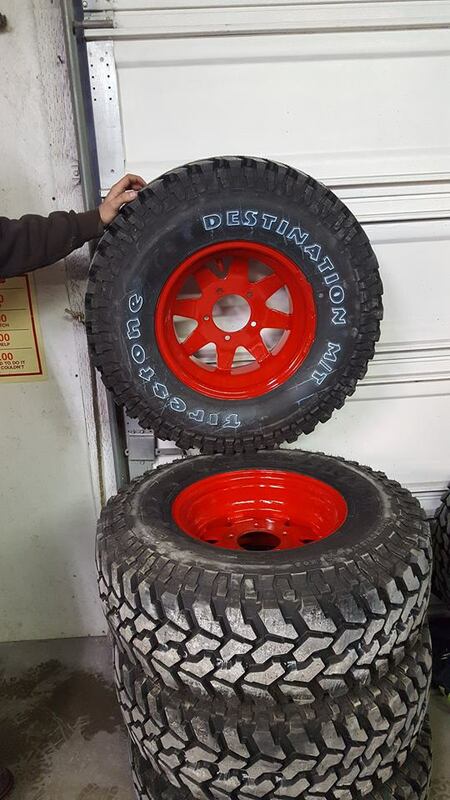 - Received and installed 4 new Rancho shock absorbers. 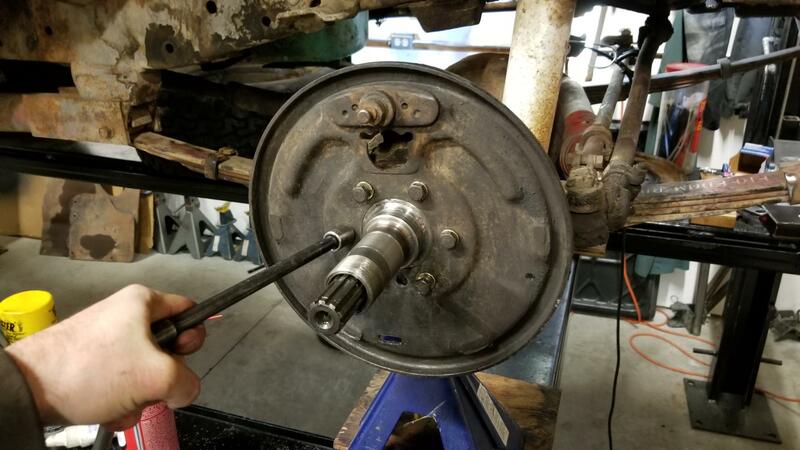 - New Rancho steering damper will be installed after front steering rebuild. 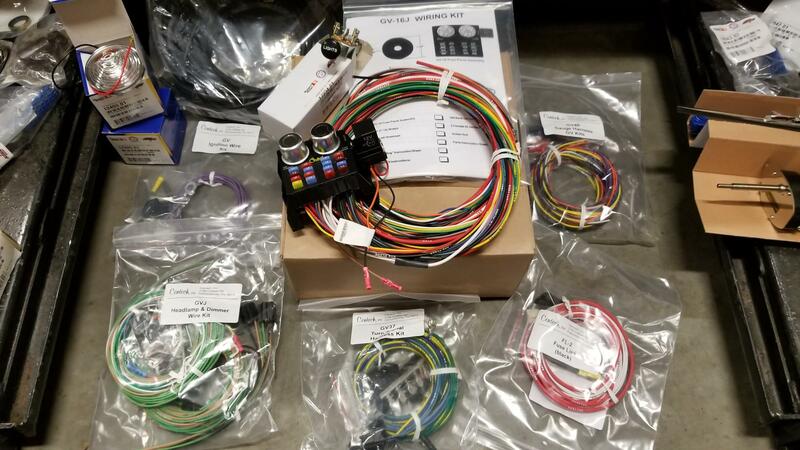 - Received and unpacked a complete wiring kit, and complete front steering rebuild kit. - Installed new front parking/turn signal light assemblies. - Began systematically rewiring the Jeep. 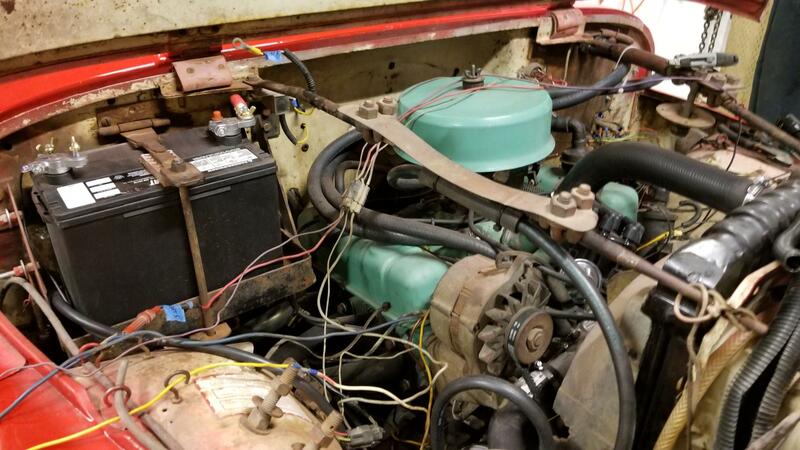 Ignition system first. - Traced and removed a lot of old dead wiring. - Installed the new fuse panel and basic wire loom. - Connected ignition wiring and started the engine. Good first day on wiring. The new wiring kit was a great asset, Loren's idea of wiring is to just splice and add more electrical tape. We now have instrument lights and horn, which, to my knowledge, have not worked since long before the Darien Gap crossing. Unfortunately, a great deal of the parts Omix-ADA sent for the steering rebuild would not fit the Sand Ship Discovery. 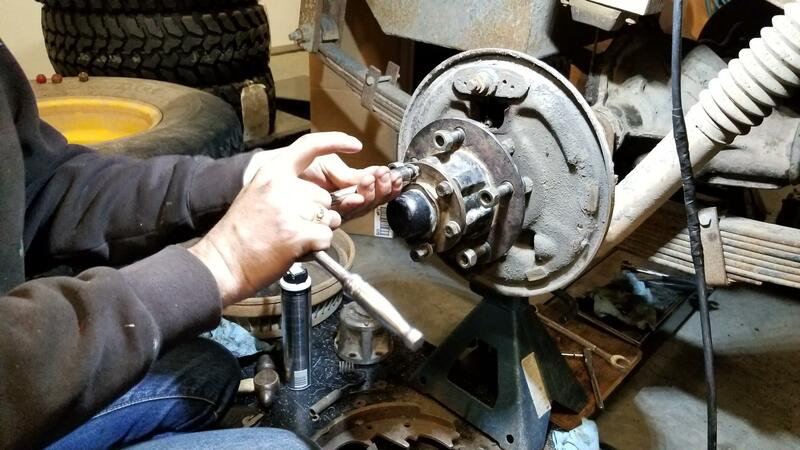 Loren seems to remember something about the steering assembly being from a Hudson? - Filled transfer case and transmission with gear lube. No leaks detected all day. Yahoo. - Continued wiring on headlights, tail lights, front parking lights, and turn signals. All now work. - Pulled most of the dashboard instruments. Lots of corrosion. Fixed all instrument dash lights. - Replaced cigarette lighter with a power port for GPS, tablet, or phone charging. - Replaced all charging system wiring. - Started engine and tested charging system. The alternator is putting out 15+ volts. Will investigate. - Rewired brake light switch. - Began installation of new windshield wiper motors, arms, and blades. - Not a drop from the transfer case and transmission. We will declare victory over that leak. - Fixed poor ground on tach affecting some dash lights. - Connected and tested power port. It works. - Installed driver side windshield wiper motor and parts. The weekend of February 2-4, 2018 Loren and I drove to Richland, WA to get our first look at the new and improved Sand Ship Discovery. Laurence had arranged for a reporter, Alex Burch from KEPRTV, the Tri-Cities local CBS station to film the event. Loren and I got to meet and talk extensively with the key people involved in getting the Sand Ship road worthy. We will always be gratefully to Laurence and Lora Upton, Mike and Jill Merk, and Larry Merk for all of the time, dedication and attention to detail that they put into the Discovery. On our entire trip around the world Loren was always in the driver’s seat – both literally and figuratively. I was always in the passenger seat as navigator. Due to some of Loren’s health issues our roles have changed. I will now be driving the Sand Ship Discovery, something I have never done. When we were in Richland Laurence took me out for a test drive. Eye-opening to say the very least. There is power-nothing on the Jeep. 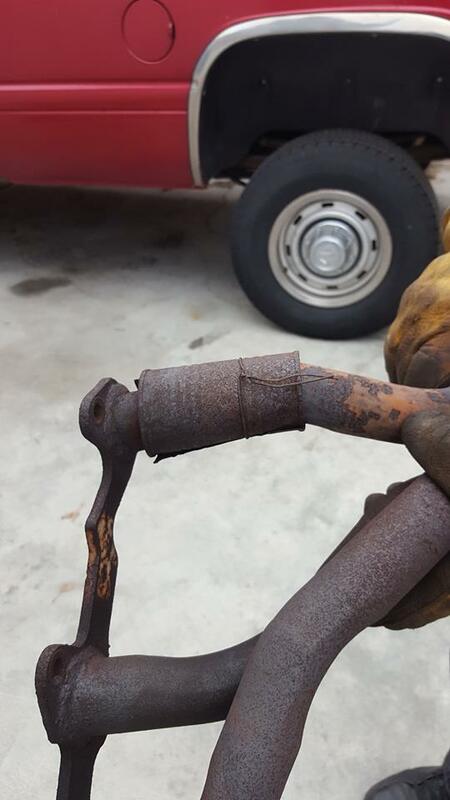 No power steering, no power brakes. The lack of power steering is reasonable, and I think I will adjust to that, okay. The lack of power brakes is a bit more challenging to overcome, I need to be watching way ahead and planning well in advance to brake. When asked what it is like to have no power brakes, my description was, drive your car down the road at about 30 mph, turn off the ignition, then apply the brakes. You feel like you have to stand on them with both feet in order to be slowing down. But as Loren has always said, we’ll make it work! On Sunday, February 4, 2018, we turned the Sand Ship Discovery over to a complete stranger, something that has never been an easy or worry-free prospect. The land transportation company, OK Auto Carrier out of Federal Way, WA, was very professional. First off, the truck that picked up the Discovery was totally enclosed, a great plus! Second, the driver, Tim, was very prompt in replying to phone calls and text messages. He arrived ahead of schedule at the pick-up point. When we arrived with the Discovery, Tim and I did a walk-around so that he could indicate on a receipt where there were dings and dents. This was rather pointless, as Mike pointed out, “It might be easier to circle the places where there are NO dings or dents.” With the paperwork done, Tim got right to the loading process, with Loren’s close supervision! Once the Discovery was secured to Loren’s specifications, (which of course were above and beyond the normal) and securely tucked into the belly of the truck, Tim set off into the sunset for Galveston, Tx. Tim was kind enough to send us a photo of the Discovery at the Port of Galveston. This will be the last photo we have of the Discovery until we see her in Ashdod, Israel sometime in the middle of April. On March 1st, the Discovery was loaded on board the Bosporus Highway. We received confirmation from Penbroke Marine Services that she was indeed on board and the ship had set sail! Dealing with Thomas and Michael at Penbroke Marine has been the easiest part of this entire ordeal. They have been informative, and most helpful. Now, at the time of this website update, middle of March, the Bosporus Highway is making her way to Barcelona, Spain, via Veracruz, Mexico, and Davisville, MA. She is due to arrive in Barcelona on March 22, 2018. Once she leaves there we will have a better idea of when she is due to arrive in Ashdod, Israel. The current estimate is the 18th of April. Loren and I are scheduled to fly out of LAX on EL AL Airlines April 8th, arriving the next day at Tel Aviv, Israel. We will be in Israel a good 10 days before the Discovery is due to arrive, during which time we are planning to arrange for the Discovery's return trip to Galveston and to do some sightseeing Sightseeing that we did not get to do 30 years ago because of the tight time schedule we were on. The following link is to Aaron Copland’s "Fanfare to the Common Man" It is a stirring piece of music that I'm sure you've heard before, but may not remember when or where. And it is the Common Man who actually made this entire expedition possible, from start to finish. The common man. The men we hired to be our guides through the Darien Gap, natives who had no clue why we were doing such a “crazy” thing but were nonetheless some of the best men on the planet. The man on the street or in a village who would give us directions. The mechanic who worked late into the night to get the Sand Ship Discovery's brakes working, again. The welding shop where the workers welded the rear end of the Discovery after the abuse she received on the terribly rough roads of Tierra del Fuego, for the simple pleasure of being a part of the Expedition! The reporter who wrote a great article about the Darien Gap Crossing that helped us get free transportation across the Atlantic to Africa. The people who gave us a place to stay for a night or two, a week or two, or many months. The man who helped us find gasoline when none of the gas stations had any. The working government officials who went above and beyond to help rush us through customs to get onboard the ferry. The people who would help us exchange money in some pretty spooky places. Yes, on a whole it was the common man who helped a carpenter and a secretary accomplish this expedition. And once again, it is the common man, Laurence Upton, Mike Merk, his father, Larry Merk and their spouses who have made this Final Mile a reality. They all are working men and women, with jobs, families, and responsibilities and they gave freely of their time to make the Discovery road worthy. To all of them, the common man, Loren and I will always be grateful. The mere words, Thank You, are not sufficient to express our gratitude. So, when you listen to this wonderful piece of music think of the common man, the people who make it all work! YOU! And in our opinion, anything but common! Loren and I feel extremely blessed to have met so many extortionary people who have made our lives complete and our dreams come true. The last quixotic grand hurrah!